Action = Results! There is a saying, "April showers bring May flowers!" As I write this article we are getting heavy April showers and it made me think about this old saying. That then reminded me of OSEPs push for RDA — results driven accountability which in turn reminded me of how important it is for our CASE members to be involved in the development and implementation of the State Systemic Improvement Plans (SSIP) and the State Identified Measurable Results (SIMR). Just as the April showers result in beautiful flowers, we have to work for the efforts on and with the SSIPs and SIMRs in order to see improved achievement results for students with disabilities and indeed ALL students! If you do not know what is going on with your SSIP and what the SIMR is in your state, then reach out to your CASE subdivision in your state. If your state does not have a CASE affiliate, then contact me and let's talk about how to get this great resource to you! So, let's say you are a Canadian member... You do not have SSIPs and SMIRs. But, we need to hear from you on what YOU need to help you and your districts improve student results for all students. We have two Canadian CASE Subdivisions (OCASE-Ontario and BC CASE-British Columbia) but we have members in 4 other provinces. Admittedly, I do not have the expertise in Canadian affairs and needs so I have to depend on YOU to help us provide the resources you need! Please contact me and let me hear what CASE can do for you! We are all interested in seeing results and we just need to know how to better do that for all students! The CASE quarterly newsletter went out two weeks ago. We are hoping if you are a member you received it as an email on April 3, 2015. If you think you missed it, you can always retrieve it from the MEMBERS section on the CASE website. But of course, you can only go to the Members section if you are a member of CEC/CASE. I hope you will be sure to read the newsletter as it has some amazing information in it on upcoming and past events as well as good advice on the upcoming IEP season. And you don’t want to miss the great information in our series on What Every Principal Needs to Know about Special Education! I do have to admit I made a mistake — you guys never do that, right! On page 16 there is a list and thank you to our Unit Patrons. I inadvertently left off one of our newest patrons — Florida Council of Administrators of Special Education, FLCASE, is a GOLD Patron! Thank you so much to all of our Patron units — no matter what the level, we appreciate your support! My apologies to our great members in Florida! Speaking of great members... If you did not receive the eNewsletter and if you cannot get into the Members section of CASE, chances are good you are not a member. Please contact me if you think this is a mistake and I will help you check this out with CEC. If you are not a member, I hope you will consider all the reasons you should be a member! It is the best time to join — you can join for as little as $125 — $65 for CEC and $60 for CASE. But wait, for just an additional $50 you can join at the Full member level with additional benefits (Total CEC/CASE = $175) or for an additional $55 to that membership you can be at the Premier level (Total CEC/CASE = $230). Perhaps the best deal is the District/School membership for $1300 which not only includes your CASE membership but also 1 premier membership and 5 basic memberships and so much more — including additional webinars and 2 registrations to the CEC Conference! To learn more and join, click here. 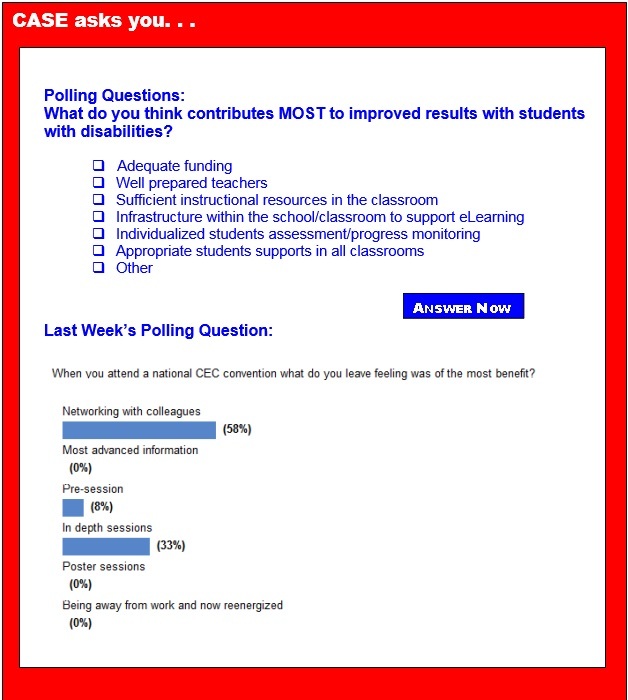 Last Week's Poll asked, "When you attend a national CEC convention what do you leave feeling was of the most benefit?" The first place answer with 58 percent was networking with colleagues! At 33 percent and second place was in-depth sessions. Third and last place with only 8 percent was pre-sessions. I will have to say I receive the most benefit from networking with colleagues, too. I have a whole list of names of CASE members who are willing to write materials for our members as well as new questions to take back to OSEP and our legislative committee. We really have to talk to each other if we are ever going to get policy makers to listen to us! Make sure you are talking with your CASE leadership! Thanks for all you do all the time to improve your skills and knowledge so our parents, staff and students can benefit more! Chairman Alexander, R-Tenn., and Ranking Member Murray, D-Wash., have shared a new bipartisan draft bill to rewrite the Elementary and Secondary Education Act. While the bill does include some important provisions that support students with disabilities, the bill does not go far enough. In fact, high ability students and preschool children are ignored in the bill. In addition, provisions and resources for professionals are not sufficient to ensure a well prepared and supported workforce. As part of the new Results Driven Accountability initiative the Office of Special Education Programs launched theNational Center for Systemic Improvement to help states transform their systems for supporting students with disabilities. Together with NCSI, the National Center on Intensive Intervention will host the webinar, Results Driven Accountability and Intensive Intervention: Using MTSS to Improve Outcomes for Students with Disabilities on Wednesday April 22, from 3:00-4:15 p.m. EST. The Office of Special Education and Rehabilitative Services now has a twitter account. Follow them at ED_Sped_Rehab to get the most up to date news and information from the department. Seven-year-old Scott, who has ADHD, can't go out for recess because he speaks up in class without raising his hand. Rachel loses two days of recess because she hasn't earned enough points on her behavior chart for completing classwork on time. Matt's teacher keeps him in the classroom because he gets out of his seat. When recess is withheld as a punishment for misbehavior or incomplete academic work, teachers and children suffer. Teachers who know the benefits of recess for ADHD kids never withhold it. First, "acting out" behavior is less frequent among children who go to recess. Students, with or without ADHD, show improved attention, working memory and mood after physical activity. A bipartisan plan to reshape the nation’s primary education law would maintain strict limits on the number of students with disabilities taking less rigorous tests. After months of negotiation, the top Republican and Democrat on the U.S. Senate education committee released a joint proposal to update the Elementary and Secondary Education Act, known as No Child Left Behind. The Senate education panel is slated to consider the bill. Currently, students with severe cognitive disabilities are allowed to take alternate assessments in lieu of the general, grade-level tests mandated for most children. However, only 1 percent of all students — or about 10 percent of those with disabilities — may be counted as proficient by schools for taking alternate exams. While the so-called "Every Student Achieves" bipartisan bill still has significant hurdles to clear before passage, it's certainly the closest Congress has come in nearly a decade to an agreement on the controversial education law it seeks to revise. The Elementary and Secondary Education Act, the 50-year-old federal mechanism for funding the nation's public schools, was due for reauthorization more than eight years ago. No Child Left Behind is the current iteration of that law. Whenever Michael Konstalid visits a school, he makes sure to pay a visit to the basement. There, Konstalid, a roaming physical therapist for the New York City Education Department, gives his phone number to a custodian and asks that no broken furniture be thrown away until he is called. This protocol keeps him in the supplies he uses to build custom physical therapy equipment, out of things that would otherwise end up in the trash. "Almost everything I build in schools are made from scrap wood, broken desks, broken tables, broken chairs, broken magazine racks, broken unidentified things," Konstalid said. "These are some pretty tired pieces of furniture." Rhonda Stewart, a contributor for Scholastic Administrator Magazine, writes: "For the past two years, I have been teaching in an inclusion classroom. I am the general education teacher, and I partner with my co-special education teacher, Sue Grass. If anyone were to walk into the classroom, on the surface, it would appear to be like any other classroom, full of activity with students working with each other. At first glance, no one would think that this is an inclusion class because of how the instruction is differentiated for the students. This is not to say that problems do not arise, they do. But we work through them." In Michigan, about two in five third-grade students didn't test as proficient in reading in 2013. Research shows that achievement gaps present by third grade only widen as students grow up — making the early years of school the most important ones. But not making the grade on a third grade test can have greater implications far beyond the classroom. Without the proper interventions at a young age, students are less prepared to cope with the demands of school and young adulthood. Leaders from the law enforcement, military, business and nonprofit communities are now pointing to improved early childhood programming as the best solution to combat greater social issues. It's been more than a decade since the University of Iowa Belin-Blank Center for Gifted Education released a report suggesting that many students in the upper tier of their classes are just as much in danger of being left behind in school as the students in the bottom tier. An updated version of that report, "A Nation Empowered: Evidence Trumps the Excuses Holding Back America's Brightest Students," documents how 11 years later as many as 5 million students across the nation still are at risk of being too smart for their school's own good. As a special educator, I want to use well-researched practices with my students. The reasons are logical: I want my students to learn well, I want to try researched practices so I can share them with credibility with my educator peers, and best practice dictates that IEP goals are based on researched practice. One practice — cooperative learning — has been explored multiple ways with students in resource and inclusion settings. Students with special education needs can work cooperatively with other students when the correct supports are put into place. Health officials are continually learning new and interesting facts about autism. Now researchers at the University of Texas at Austin are examining certain linguistic characteristics in autistic children and how their reluctance to use pronouns could help pave the way for more accurate diagnostics in the future. "Our work suggests that the opacity of pronouns in English and other spoken languages is not at the root of the problem," said Shield, a UT Austin Linguistics alumnus and lead author for the study. "We suspect, though more work is needed, that people with autism may differ in their experiences of selfhood." According to the federal Education Department, more than 19,000 U.S. schools are using School-Wide Positive Behavioral Interventions and Supports, an evidence-based framework to reduce disciplinary infractions, improve the school climate, and increase student achievement. Similar to Response to Intervention, PBIS takes a three-tiered approach to instilling positive behavior in schools. Tier 1 focuses on interventions used on a school-wide basis for all students, such as actively teaching and reinforcing appropriate behaviors. Tier 2 applies more targeted approaches to students who need additional support, while the third tier is for students who have significant behavioral problems and may require an individual behavior plan and perhaps wraparound services. Most Americans support the basic concepts behind the Common Core, even if many do not know what the Common Core State Standards are, according to a new survey from the Leadership Conference Education Fund. In a national survey of nearly 1,400 American adults, 97 percent of respondents said students should be able to think critically and apply skills to the real world and 85 percent said the United States should have consistent education standards to raise expectations of students. But 24 percent of those surveyed said they had never heard of the Common Core and less than half, 44 percent, reported knowing some or a lot about the standards.